Alcohol, the most commonly used drug among adults and adolescents (Substance Abuse and Mental Health Services Administration [SAMHSA], 2004), is related to many adverse health outcomes, including injuries and deaths (Room, Babor, & Rehm, 2005). In 2001, excessive alcohol use was associated with approximately 75,000 deaths and 2.3 million years of potential life lost (about 30 years of life lost per death) (Centers for Disease Control and Prevention [CDC], 2004). While the magnitude of alcohol-related injury mortality is similar to alcohol-related chronic disease mortality, far more years of life are lost as a result of injuries because the injury deaths occur at a younger age (CDC 2004; Lunetta & Smith 2005). In addition, alcohol use and alcohol-related consequences among adolescents are associated with significant costs to society, as much as $58 billion per year, with the three most costly domains consisting of violent crime ($36 billion), traffic crashes ($18 billion), and suicide attempts ($1.5 billion) (Levy, Stewart, & Wilbur, 1999). 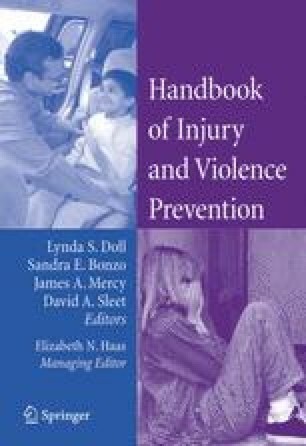 Although the magnitude and costs of alcohol-related negative consequences such as injuries and violence have been well defined and described, much less is known about the most effective prevention and intervention efforts for reducing alcohol-related injuries and violence. However, a number of evidence-based prevention efforts are available. Some of the most effective options are increasing alcohol taxes, restricting alcohol availability, and laws and programs to reduce the occurrence of drinking and driving (Room et al., 2005).